The solid bamboo wood Scandinavia platform bed is built to last. With the solid bamboo wood bookcase-style headboard, add a finishing touch to your bedroom as well as more shelf space. 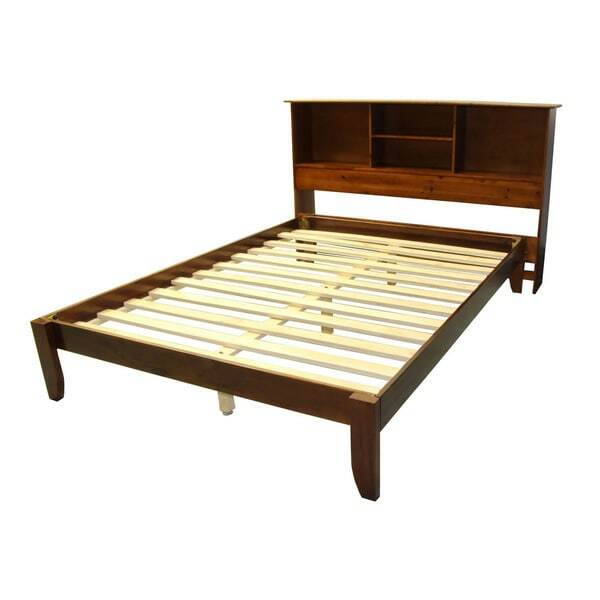 The bed frame can be used with any mattress type and with or without a box spring foundation. With its transitional design and choice of several classic finishes, the Scandinavia bed with bookcase-style headboard will complement any decor. This is my first product review ever. I was inspired to write this after referring to a picture online referencing how this item should be put together. This review is long. It is long to justify my poor rating. If you do not feel like reading it all, my feelings are summed up in line item 8. My wife bought this bed for my 6 year old boy. This was our fourth bed purchase online. The first from Overstock. The rest were from a popular kids/teen catalog. I think we will stick with doing things the old way from now on. Note: This is not my first attempt at assembling furniture. On 3/7/14...Here is my experience with the bookcase part so far...we still have not received the frame portion yet. 1) All hardware, dowels, screws, screwdriver, allen wrench, cam-fixes, and mini-fixes must have exploded out of the bag in transit. They were loose and all over the box. Had to pick all these pieces up before unpacking and laying wood pieces out. The edges of the wood pieces were scratched and scuffed. I continued to assembled since I thought the areas damaged might be hidden, or my 6 year old could do worse. Disappointed, but this part I did not find completely frustrating. 2) The directions...horribly frustrating (understated). The wood pieces had stickers with the names of the piece on them (not letters). The names were so similar, and the pictures so terrible, I had a hard time identifying parts and what went together...had to follow the worded directions...who knows...neither we very clear. Pieces were referred to by names and letters in the worded directions. I would recommend lettering each piece and not removing the stickers until after assembly if you decide to buy this product. Nothing stating if there was a right or a left...front or back, etc. Through some trial and error, I eventually figured it out (I thought). 3) While tightening the shelf up, I broke 4 of the hardware pieces they call "cam-fix". Some tightened fine others not so much. Yes, I broke metal hardware trying to tighten. Still the pieces were loose. On a good note, all the wooded dowels fit perfectly. 4) Finally, I was putting the final 2 pieces on, found out the "bottom shelf" was on backwards...who knew this was possibly! 5) Taking the shelf apart without breaking was difficult since the cam-fixes were broke, but managed to do so. Also had to remove the broken cam-fixes which was very difficult. 6) In addition, there is a piece called the "bottom front" which has horizontal slots on both ends. One picture showed the slots on the top and one showed the slots on the bottom...this is when I referred to the pictures online to determine how they should go...I went with that. Since I still do not have the bed frame, I am not sure this is put together correctly. 7) Since I broke the 4 cam-fixes and I do not have replacements, this piece of "wood" is sitting in my living room unfinished until I can get to the hardware store, or call the manufacturer for the hardware to complete. I may wait until cooler head prevail. If it is possible, I am strongly considering taking this thing apart, repacking, and returning. 8) This product is for those who like frustrating adventures in assembling poor quality furniture. I loved the look of this bed, and my recent experience with the purchase of another platform bed influenced my decision to buy this one. What a horrible mistake. The headboard is a piece of junk, you can see where the pieces of wood were fused together, the instructions were lousy. Then I opened the bed portion. Three rails are a different color than the headboard, just not great quality. wood split throughout assemby. the slats that hold the mattress had to be cut down to size. I will never purchase from this company again! Although a few of my pieces were nicked/scratched/cracked. Being black I was able to fill in the nicks with a permanent marker. I had a few bolts missing as well as the caps for the center legs. With it being delivered in pieces it was more of an inconvenience to return it so I improvised and used a permanent marker which did do the trick. The wood is thin and split when the hardware was inserted to put the headboard together. This is like staging furniture...will be ok for the couple years my son will use it before going off to college. Was excited til assembled. There is a large gap between the bed and the headboard. Had to come up with an idea since this is a child's bed. This item was the biggest disappointment that I believe I have ever seen from overstock. The Bed itself was ok but the Headboard is the cheapest piece of wood all warped and would not fit together. No words can even describe how I feel about this. Directions were the worst ever, photo copied, blurry and vague. The bed now that it is put together is ok for the price. The design of of legs on bed are rough and sharp. Son has already bumped into them. Despite the negative reviews of this product, I purchased it and have been pleasantly surprised. Looking up the bed frame reviews separately showed that they were much more positive than the headboard reviews. The bed frame is just what I was looking for. Looks nice, easy to put together, sturdy, and affordable. The headboard is definitely more difficult to put together, it is hard to get the boards to sit flat onto each other (even with a hammer). However, I got it together by myself and minus a few gaps here and there, it looks quite nice! It attached to the bed frame easily and is sturdy enough for my purposes. Overall, I am enjoying it so far!! The instructions were very hard to understand, The bed is not the best quality either , Would not recommend this bed I would pay a little more money and get a better quality bed. Not the best....headboard color did not match frame color...missing bolts/parts and poor instructions made assembly a challenge. Overall quality of bed and assembly parts are poor. I was very excited when I received this item because of the material. All wood and looked very good' however, almost gave up when it came to following the directions. They are horrible. If we had not just put together 2 other beds, different manufacturers and good directions, we probably could have never figured this one out. If a novice don't buy it. If you want a challenge and great final product then give it a try. Note to the manufacturer..... it would be so easy to make your instructions easy to follow, spend the time in rewriting them! "This is my second order of this bed. I was able to purchase the under the bed drawers for the one I have. I have not been able to locate them for the full size bed in oak. Do you have them and how much are they? Thank you, AnnaMarie"
Please see item# 16620320 for the drawers. "Does this bed come with drawers underneath? I do not want drawers but photos vs description are confusing." Hello Angie, thank you for your inquiry. Unfortunately, the information you have requested is currently unavailable. You will receive an email notification once an answer is posted. Have a great day. I chose this product because I was not interested in a captains bed since my son has a other drawers and cupboards to use in his room. I like the color of the wood since it matches the other furniture in his room.